Religion, social justice, and public life is the tagline for Religion For Life. 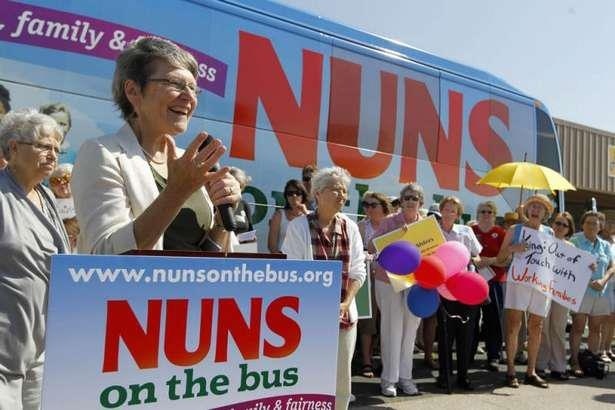 The nuns on the bus are at the center of that intersection driving for faith, family and fairness. Sister Simone Campbell of Network, a National Catholic Social Justice Lobby, talks to me about her bus tours to speak on behalf of the 100%. 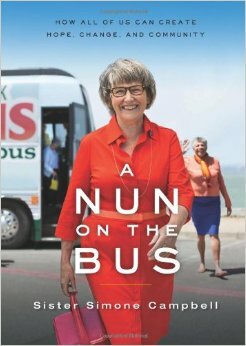 Her book, A Nun on the Bus: How All of Us Can Create Hope, Change, and Community is an uplifting and serious call to get off the couch, rediscover our values and reclaim our democracy. Thursday, August 28th at 8 pm on WETS, 89.5. Saturday, August 30th at 1 pm on KZUM, 89.3. Sunday, August 31st at noon on WEHC, 90.7. Sunday, August 31st at 2 pm on WETS, 89.5. Monday, September 1st at 1 pm on WEHC, 90.7. Wednesday, September 3rd at 6:30 pm on WEHC, 90.7. Via podcast beginning September 4th.